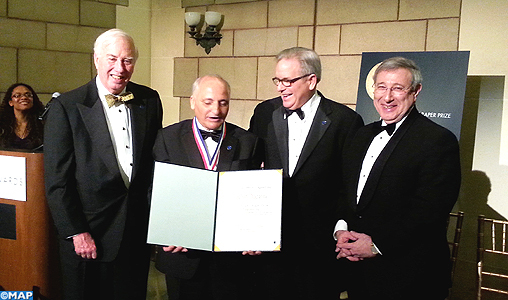 Maghreb Arab Press (Washington, DC, February 19, 2014) — Eminent Moroccan researcher Rachid Yazami was awarded the prestigious 2014 Charles Stark Draper US prize in Washington on Tuesday, presented by the National Academy of Engineering (NAE) in recognition for his work in developing rechargeable lithium batteries 30 years ago. Prof. Yazami is sharing the USD $500,000 worth prize with American John B. Goodenough, and Japan’s Yoshio Nishi and Akira Yoshino, who have also contributed in this major industrial and scientific breakthrough. The prize-awarding ceremony took place on the occasion of the 25th anniversary of the Draper Prize. The lithium-ion battery is used by millions of people around the world through the commonplace use of cell phones, laptops, hearing aids, cameras, tablets, power tools, and many other compact, lightweight mobile devices. Rachid Yazami began exploring graphite compounds in which lithium could be reversibly inserted between graphite layers. This provided an alternative to the lithium metal negative electrode. Yazami’s lithium-graphite is the most commonly used anode in commercial lithium-ion batteries today. Yazami began his career and the Centre National de la Recherche Scientifique (CRNS) in France, where he later became the research director in 1998. He also served as a visiting professor at the California Institute of Technology between 2000 and 2010, before being appointed as a visiting professor at the Nanyang Technological University (NTU) in Singapore, where he later became the Cheng Tsang Man Chair Professor in Energy at the School of Materials Science and Engineering. The Moroccan engineer owns over 70 patents related to battery technology.